Two isn’t exactly enough to make a tribal deck but its nice to see more than one card based off of a cryptozoology monster. Not much to go into detail with Ravenous Chupacabra, its “Murder” on a body. Both simple and effective. Although Black can not destroy artifacts or enchantments, its still the best at destroying the most prevalent and powerful card type. Although it has a hard time killing gods, this beast is very efficient. If you’re doing a Meso-American themed set, including the legendary chupacabra is pretty much a given; both Ixalan sets had a chupacabra, but this one is the real deal. It’s easily one of the most powerful uncommons in Rivals of Ixalan, stapling a 2/2 body to a Murder and invoking memories of Nekrataal in the process. Being able to turn your kill spell into another body on-board is absurdly good value, and there are a lot of targets for this goat-muncher to devastate in both Limited and Standard. 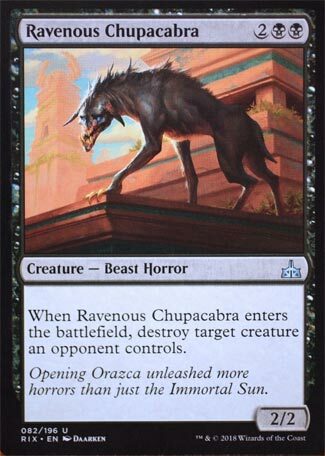 Ravenous Chupacabra hits a lot of things, though it does blank on a couple of creatures, like Carnage Tyrant and Hazoret. Even with those misses, it still offers a massive swing that allows you to seize control in shaky board states and re-stabilize if things are going south. It’s apt to be a major factor for Ixalan‘s time in Standard, to say the least, even if it’s not particularly great past Standard (where the likes of Shriekmaw largely outclass it). Next articleDo Mic Shield Block Noise Effectively?